One of the lead developers of GHC, by far the most-used Haskell compiler in the world. Simon implemented virtually all the technology that the book would be covering. He taught a summer school on this material last year, and is teaching another one this year http://www-hpc.cea.fr/SummerSchools2012-CS.htm Simon is a lead figure in the Haskell community. He chaired the Haskell 2010 committee, and is the editor of the Haskell 2010 report, the latest revision of the language. This book is NOT meant as a first book in Haskell. For that, I would suggest "Learn You A Haskell" or "Real World Haskell." However, this book is absolutely amazing for parallel + concurrent programming. The book looks thin, but it's packed with technical insight and details. Simon Marlow is one of the top Haskell programmers and he has written a very clear presentation on the different ways of achieving concurrency and parallelism, and making sure your program is performing well using a number of tools. An excellent book. It even goes into distributed Haskell which is still (as of 2015) a work in progress. Excellent overview of the concurrency options in Haskell. The language has many different ways of approaching this problem, and this book covered each well enough to impart the core concepts. For specifics, I can consult a reference or the web. 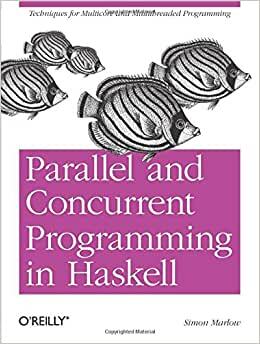 One of the best books on Haskell (and parallel & concurrency in general).